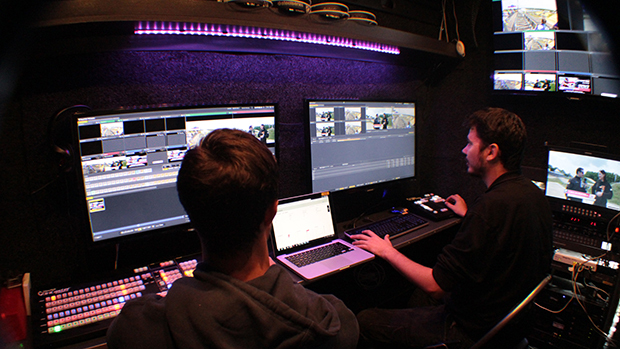 The team of engineers at industry leader, 3xScreen Media, kept these principles of innovative and improved design in mind when they designed and built their state-of-the-art OB Van, affectionately known as Mildred. The idea behind the construction of Mildred was simple: utilize the latest connectivity, broadcast and production technologies in new and innovative ways to capture the essence of the traditional OB van with unprecedented elegance and efficiency. Mildred takes the functionality of a very expensive, traditional OB workflow and with a few twists and turns, provides this functionality with the benefit of being re-engineered for improved affordability. This may not be reinventing the wheel, but what Mildred represents is the future of outdoor broadcasting. What is being seen across the board is kit being reduced to fewer pieces that have greater functionality and mobility. Crew is smaller yet more multi-skilled and connectivity has more flexibility and reliability than ever before. 3xScreen managing director Scott Robinson says, what we wanted to do, and what we knew we could do very well, was replicate the functionality of traditional OB workflows, but without replicating the exact kit and details. Taking such a unique approach in utilizing new technologies, the team of live streaming engineers at 3xScreen Media have created a next-generation OB Van that makes broadcast quality live streaming available without the traditional OB price-tag. As far as modular OB vans go, it is what isnt inside Mildred, which is as important as what is inside her. For example, the modern substitution for traditional Triax cabling is over one kilometre of lightweight military grade fibre optic cabling for long-distance camera feeds that also integrates production communications. What may be surprising to many of 3xScreens peers is that Mildreds permanent kit is essentially made up of a few screens, some keyboards and cabling. The heart and soul of Mildreds functionality is the removable production pod. The ability to easily wheel the pod into the back of Mildred, and connect a few cables to transform her into a fully functioning OB van means that the kit is not restricted to vans-based production use only. In brief, the key production features of the pod include an eight-camera vision mixer, full motion graphics and media players, audio mixing including compressor/limiter on all sources, the ability to make ISO recording of up to eight sources in ProRes, file-based ProRes editing via a Gigabit Ethernet network and placement of removable Hard Disk Drives in HDD caddies and live edit via Thunderbolt interface. There is also the capability for up to six-channel replays with four input sources and two fully independent, simultaneous playout channels, full SDI workflow with SDI routing of all inputs and outputs. Starting with the vision mixer, Mildred is equipped with the latest from NewTek, the TriCaster 860. A great example of increased functionality, the 860 allows for up to eight simultaneous live video sources in any combination of HD-SDI, HD Component, SD-SDI, SD Component, Y/C (BNC) or Composite connections and resolutions. It has 24 switcher channels and two network sources and has audio mixing and compressing capabilities as well as ISO recording of up to eight sources in ProRes. Partnered with the TriCaster 860 is NewTeks 3Play 425, which brings additional production values to the table. 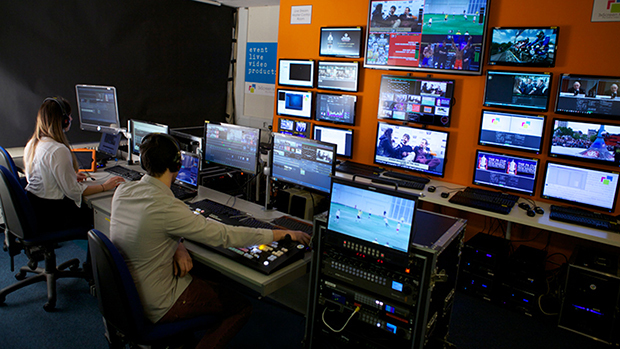 It provides up to six-channel replays with four input sources and two fully independent, simultaneous playout channels. Full motion graphics can be incorporated into the live production with two LiveText computers that allow fully automated graphics such as names straps and lower thirds to be edited on the fly and made live during the broadcast along with a monitored live Twitter ticker for those events requiring live social media integration. The recent integration of Young Monkeys Master Control to the graphics workflow has allowed us to fully automate the live graphics, allowing the TriCaster operator to focus on vision mixing. To further enhance the sound and audio capabilities of the NewTek production suite, the 3xScreen OB van has an integrated multi-channel audio mixer for internal and external audio sources, outputs, stream and headphones. There is a seven-band equalizer and full stereo compressor/limiter per input and output. Digital audio inputs are equipped with audio time-base synchronizers. For events requiring live commentary, commentators are provided with Coles lip mics and a program output monitor and can be located anywhere onsite. Out in the field, camera operators enjoy the benefits of wireless Tally from Boxx and additional camera-top monitoring and recording in ProRes via Atomos Samurai field recorders. The BMD ATEM camera converters utilised at the camera locations can be used on their integrated batteries. For some sporting events that require our cameramen to be as unencumbered as possible, wireless camera connectivity is provided by Teradek zero-delay Bolt 5GHz wireless links. This workflow design eradicates the necessity for power to be supplied to the camera positions from the truck so they can be either be powered by battery or to be connected to mains power. Other camera options are on-hand for events that require a custom solution. A diverse range of GoPro mounting options, including a doggie-cam and a flying zipwire DactylCam, are testament to the dedication of the 3xScreen team to providing a solution to any brief. Newer to Mildreds kit is a set of Sony BRC robotic cameras that give greater flexibility with both camera positions and crew restrictions - handy for when placing cameramen out in the field is either impractical or unsafe. Beauty shots are provided by a combination of GoPro Hero3 point of view cameras and steerable Axis HD camera heads that are powered over Ethernet and can be remotely controlled by an iPad or PC. So far unmentioned is Mildreds network connectivity, a key outstanding feature, consisting of a self-seeking KU-band broadband satellite dish, KA-band fly-away broadband satellite connection, the latest in mobile uplink technology, plus the ability to connect to venue Ethernet and WiFi from a distance up to one kilometre. This is designed to work around most conceivable connectivity issues that may arise even in remote and unconnected locations. 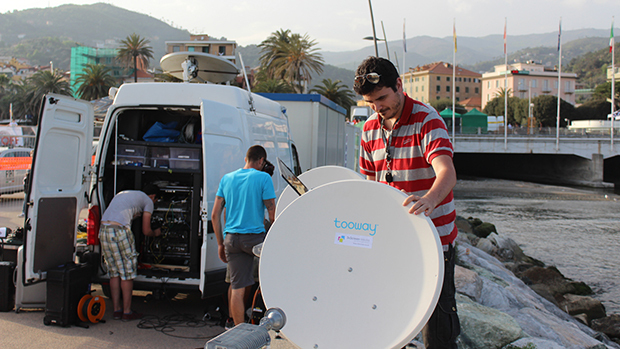 The aforementioned connectivity options, the KU and KA broadband satellite dishes and 4G connectivity are essentially the back up to the reliable and adaptable LiveU LU70 mobile uplink solution. The LU70 bonds seven 3G and 4G connections from various service providers and intuitively selects the strongest connections enabling it to send the program output to our MCR in London where further production values can be added if need be before it is encoded and sent to the clients publish point(s). With such a comprehensive kit and functionality, Mildred is more than able to keep up with todays very demanding consumer. From the client to the end viewer, todays consumers are expecting immediate access to HD live video content and this demand is growing at an increasing pace. In the US, 35% of connected adults who use a tablet, stream video on their devices at least weekly. In the UK, 78% of people watch online video at least once a week and 55% watch everyday. With appetites growing as fast as expectations of stream quality, its companies with the ability not only to evolve but lead the pack, like 3xScreen Media, who continue to raise the bar in live streaming and production both today and in the future. Having firmly established themselves as the leaders both in the field and in R&D, 3xScreen Media credits Mildreds efficient functionality and clever design as a key to their successful outdoor broadcasts. As the next generation of modular outdoor broadcast and live streaming van, Mildred is custom designed to make the production and live streaming of any event easier and more affordable without compromising on the quality of the final product.